In my home, the bag containing the gifts I gave my roommate Des travels fairly quickly from the gift bag stash to his desk and back to the gift bag stash. Des and I know that the important thing isn't having a new gift bag every year (you already have a stash of them by now, right? Who needs more?? 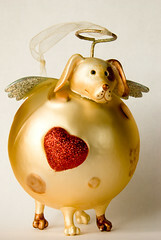 ), the important thing is having a new glass dog ornament every year to add to your increasing glass dog stash.